I went for my first dress fitting on Saturday, and afterward Megan and I went to Hobby Lobby to look for the guest book frame. 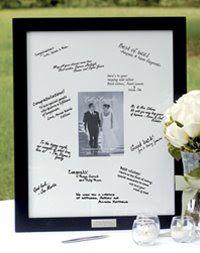 Let this be a public service announcement to you: If you are getting married and want to have the photo frame to sign as your guest book, GO TO HOBBY LOBBY. This is what I found on theknot.com's wedding shop. I'm pretty sure it isn't even the same size, and it's way more expensive than I paid for. I like mine sooo much better. Hobby Lobby is constantly having a 50% off sale - so I ended up getting this frame for $20.00ish. The one on The Knot is $56.00 and then shipping on top of that. No thanks. I'm pumped.